Forehill Primary School provides an out of school hours childcare service, registered by the Care Inspectorate, for children aged between 3 and 16 years from Forehill ELC & Primary school and any other local school during school holidays. FASC is a self-funding organisation and we hold fundraising events throughout the year. The group operates from the main hall at Forehill. We can be contacted on 07838 131 353 or 07988 096 775. You can e-mail us via fasc_outofschoolcare@hotmail.co.uk or fascbackup@gmail.com. Promote a positive relationship with parents/carers and Forehill Primary School and work in partnership to provide high quality play and care for the children. 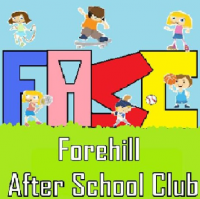 Forehill After School Club staff are all qualified, registered with the Scottish Social Services Council and have full enhanced Disclosures. Breakfast Club from 7.45am-9am Monday to Friday, toast is served for breakfast. After School Club Monday – Thursday we are open until 6pm and Fridays until 5.30pm, we provide a healthy snack for children when they come in from school. Please contact us regarding fees. indoor and outdoor play, sports and games, arts and crafts, music and drama, construction play, messy play, imaginative play, homework corner. During holiday club we often include outings to the Beach Park, Millport, The Transport Museum, Girvan, Swimming Pool, Largs, Glasgow, Soft Play, Rozelle & Belleisle, Culzean and Kelburn.